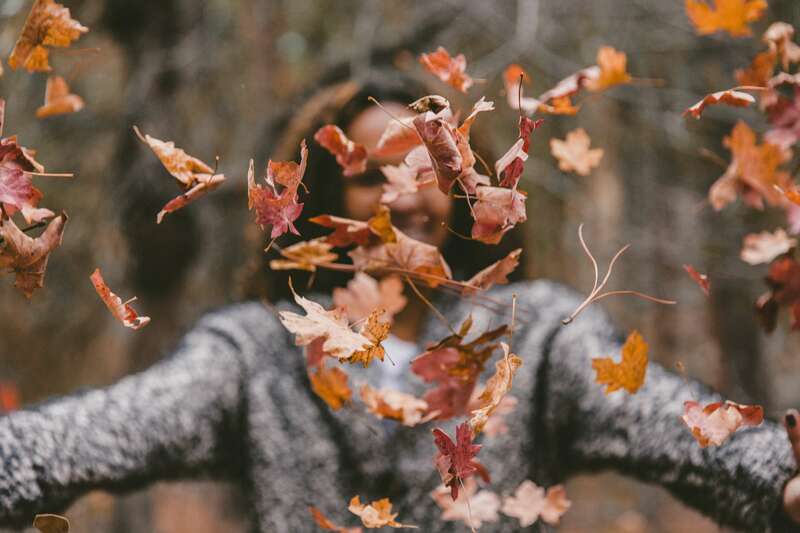 If it’s the fall season, you have to check out these fun leaf activities for kids. Leaf themed games, art and craft ideas, poems, and much more. 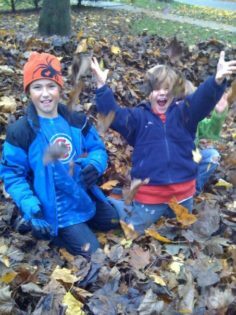 Kids love leaves especially jumping in a pile of them. 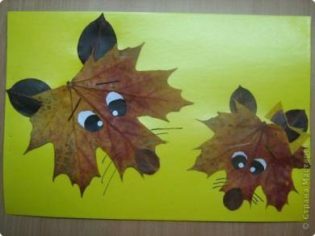 These leaf ideas will have kids engaged and excited about autumn. This game is best played out-doors, but you can also gather pinecones and play this traditional game inside on a rainy day. Depending on the size of your cardboard box, cut One to large leaf shapes into the cardboard. to play–children throw bean bags through the leaf shaped holes. 1. While children are out of the room (or if in room have them cover their eyes) hide a leaf. (The leaf can be ‘real’ or draw on cardboard and cut out.) Hide the leaf where the children will need to search–but not too difficult to find. 2. Instruct the kids to sit down in a pre-designated spot when they see the hidden leaf. 3. After all children are sitting–the first child to ‘spot’ the leaf hides it for the ‘next game’. (If you are going to frame–you can pre-trim the paper to fit a 5″x7″ frame–frames can be made from foam, cardboard or card-stock). Glue colorful and different fabrics to both sides of several pieces of heavy paper. Cut out leaves from this. Tie a string on each leaf. Suspend the leaves from a small branch. Hang them where they might catch a breeze. 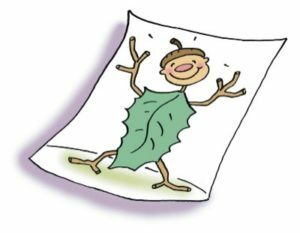 LEAF PEOPLE #2 –Glue a leaf to a sheet of paper and draw features to make them into leaf people and animals… put arms, legs, necks, heads, tails, etc. when complete draw a scene around your leaf person! Place your leaves UNDER sheets of white paper. Rub the sides of red, orange and yellow crayons on the paper — Rub over the leaves until leaf shapes appear. Cut out leaf shapes and paste them to background paper. Add heads, arms and legs. It would be fun if the leaf people were engaged in some activity. Cut 4 1/2 inch circles out of construction paper. Collect a variety of fall leaves. Glue the circles on paper and glue some leaves around the circles to make hair. Complete the faces by adding facial features with markers or paint. NOTE: Be sure to check out the leaf fox/dog image a couple entries below!!! Soooooo cute! Collect leaves and arrange them on a piece of wax paper. Add wax crayon shavings and apply another piece of wax paper on top. Iron the wax paper together until crayon shavings have melted. Take coffee filters and cut them into the shapes of leaves. With cups of liquid watercolors in orange, yellow, red, and brown have the children use eye droppers to place watercolors on the filter leaves. The colors blend together for wonderful fall leaves. Create a tree trunk out of brown wrapping paper or butcher paper. Add leaves to the branches and also at the base of the tree. Have children place a variety of leaves -underside up – under a piece of light colored construction paper. With the sides of crayons that have had the paper covering removed, make crayon rubbing of the leaves. This works better with green leaves. Great way to see the veins and differences in leaves! Collect leaves with long stems. 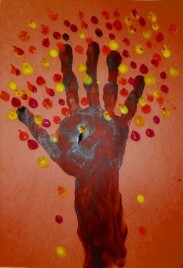 Have children paint with the leaves, using the leaves as brushes and the stems as handles. 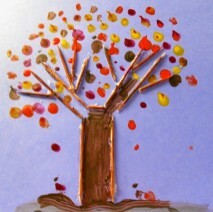 Or…Collect leaves and tape them to a small stick and use them instead of brushes for painting. 14. START WITH A LEAF AND LOOK WHAT YOU GET! TIP: Instead of using toothpicks for the branches–pretzel sticks, pasta, or twigs can be used! Set out pieces of aluminum foil and a variety of fall leaves. Have each child select a leaf, place it under a piece of foil, and gently press and rub the foil with their hand to get a leaf print. 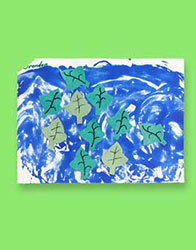 Have children glue their leaf prints to the construction paper. 1. Draw leaves on construction paper with Crayola Markers or Crayons. Or gather fallen leaves from outside and trace them. (Wash hands thoroughly afterward.) Draw veins and other designs on the leaves. 3. Spread newspaper over your craft area. Dip your finger tips in Crayola Washable Finger Paint. Spread the paint in swirling motions–like the wind–over white construction paper. Wash hands. 4. While the paint is still wet, place leaves on the paper. Arrange them in different directions so they appear to be blowing in the wind. Leaves stick to the paper when the paint dries. Give children white paper and have them paint using red, and yellow paint. They can mix the paints to create orange. When the papers are dry, using templates, draw leaf shapes on the back. Cut out the leaves. With a brush, paint red, orange and yellow tempera paint onto the front side of leaves. Press the painted side onto paper. For a variation, place the paint on the back side of the leaf and press down–you might see more distict markings on this print. Next cut out a tree trunk with branches in proportion to the amount of leaves. Have the child glue the hand shapes to the tree to form the leaves of the tree. Consider having children think of things to be thankful for — and label the leaves. Place leaves on the sticky side of clear self-adhesive plastic. Cover it with another sheet of plastic and press. Cut around the leaves. Punch holes in them and thread yarn or ribbon for a leaf hanging. Also…cut a single leaf and use it as a bookmark. Make a string of leaves to decorate a room. 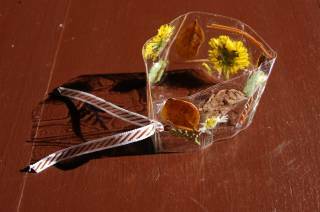 These simple-to-make strings make a great Fall or Thanksgiving decoration. You can drape the strings across rooms, over windows and from the chandeliers. Draw a leaf on a piece of construction paper. 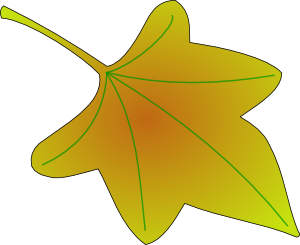 Make sure to draw a long-thick stem on the top (your leaf will hang from this stem, which will be folded over.) It would be a good idea to make a few leaf templates for the children to trace and cut the shapes. Cut out the leaf. Draw the leaf veins if you wish. Fold the leaf’s stem in half. Attach the leaf to a long string using tape, glue, or staples. Make more leaves and attach them to the string. Wrap a piece of masking tape (sticky side out) around each child’s wrist. Go on a nature walk and have children collect a leaf from each of several trees—sticking it on their leaf bracelet. Get a Book with a variety of leaves to compare ‘finds’ when you return. Children will also be able to go home and see what leaves they find there! As shown, you can take clear packing tape and make bracelets with a variey of nature finds–as well as some wonderful bookmarks! Photographs are courtesy of Angela at Colorfool blogsite…Angela shares that flat items adhere better than bulky. 1. Either draw a tree trunk and leaves… or cut out the trunk of a tree with limbs. If cutting out a tree trunk, glue or staple the trunk to a piece of background paper. 3. 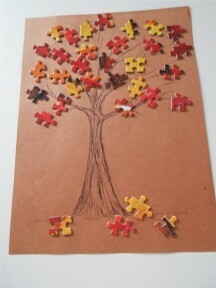 Glue the puzzle pieces to the branches of the tree. Use a rolling pin to flatten clay or DRYING TYPE dough. Lay a leaf on the clay & roll over it. Remove the leaf & let the clay dry. Paint the clay with fall colors of tempera. “Air dry and bake recipes” are on this site in the Play Dough Category! Gather old brown leaves–and crumbel them up! Draw your pictures (leaves or a fall scene would be nice)—-apply a light coat of glue or wet paint–sprinkle with you leaf glitter! You could also paint the leaves before you crumble them to make different colored glitter. 2. Pour 1/4 cup (50ml) white glue into an empty margerine container. Add 2-3 drops of green food coloring to the glue. Mix well, until the color is a shade you like. 3. For a good work surface–Place cardboard leaf into a styrofoam vegetable tray. Paint the entire surface of the leaf with the colored glue. 4. Break spaghetti sticks in half. Line up the spaghetti sticks in a single direction on the leaf. Be sure the spaghetti is adhering to the glue. Leave the spaghetti untrimmed at this point. 5. Cover the untrimmed spaghetti with glue-coloring so that it is completely colored. 6. Let the leaf dry on a clean styrofoam tray. Once the glue has dried, carefully cut around the edges of the cardboard shape to remove the excess spaghetti. It is helpful to turn the leaf ‘spaghetti-side down’ while cutting the spaghetti. 7. Repair jagged edges with glue and pieces of trimmed spaghetti. Allow to dry a second time. 8. Adhere two magnets to the center of the cardboard back. This project also makes a great lapel pin. Just use a pin backing instead of a sticky-backed magnet! Go on a nature walk and collect different kinds of leaves. Sort the leaves by color, size or type of leaf. Place them on your science table. 1. Have children count the number of leaves collected from each type of tree. Graph the results. What can you tell me about these leaves? What is the same about these leaves? What is different about some of these leaves? Sea shells, rocks, crystals, geodes, pine cones, seeds, leaves, twigs, etc. You can preserve fall leaves in your microwave oven. Choose fresh leaves with the bright colors. Avoid fallen leaves that have already begun to dry. Place separate leaves in the Microwave oven on top of two pieces of paper towel. Cover them with one sheet of paper toweling. Run the oven for 30 to 180 seconds. Microwaves vary so watch carefully. The drier the leaves, the less time they will need. Be careful, if the leaves “cook” too long you could actually start a fire. If the leaves are curled on the edges they need more time. Let the leaves dry for a day or two and then finish the leaves with a sealant, such as an acrylic craft spray. 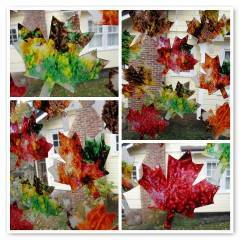 Place your autumn colored leaves between two layers of wax paper. Cover with a cloth rag. Using a warm (not too hot) iron, press down on the wax covered leaves, sealing the wax paper together with the leaf in between. Cut your leaves out, leaving a narrow margin of wax paper around the leaf edge. COLLECT GREEN LEAVES and place them on a tray to dry…. Over time they’ll turn brown; without chlorophyll the leaf loses his green color. Place a small branch with fall leaves on several layers of newspapers. With a hammer tap the end of the stem until it is slightly crushed. Place the branch in a jar or baking dish with one part glycerin to two parts water. Keep it for 2 weeks. The leaves will be thicker to touch, colors will have changed & they will not disintegrate or fade.. 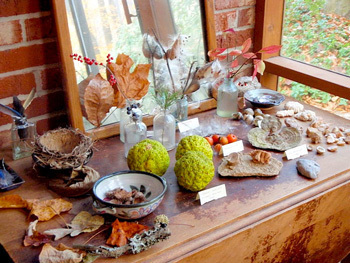 In the autumn, you can also gather branches of oak, beech, and maple leaves just as the colors began to turn. Submerge them in vases filled with a solution of equal parts of water and glycerin. Over the next week, watch the color metamorphose as the chlorophyll ceased production, triggering the release of pigments. The glycerin, an emollient, fills the cells, rendering them supple and leathery. Leaves will last for years this way, more so if pressed. 34. IF YOU FIND A CATERPILLAR in late summer to late fall, put FRESH LEAVES in a tank or fish bowl with a few twigs on which to make a chrysalis. Ask children what they think happen? Ask them what will happen later? Make pictures of trees with different numbers of leaves on the trees. Have the children count the number of leaves on the tree. Set out two of each kind of leaf the children and/or you have collected… and have children find the matches. You will also need some Wax paper to lay your leaf piles on. NOTE: When KA tested this recipe, there at first was an, “Oh No moment”! 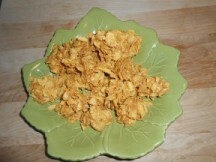 Halving the recipe — after mixing the Karo and peanut butter mixture in with the corn flakes– the leaf piles seemed rather loose when putting them together on the wax paper. I pushed each small pile as closely together as possible. After 2-3 hours, the leaf piles did firm and hold together. R pronounced he liked them… I see them as a nice Fall novelty. We usually eat the roots of plants–but there are many leaves we eat! These include artichokes, celery, lettuce, onions, cabbage and spinach. We also eat herb leaves of sage, mint, parsley, thyme, bay-leaf, etc. Each of these plants has very different looking leaves. Discuss the difference in these ‘leaves’ and have children try some! Maybe a salad made from a variety of lettuce/leaves — or a good cabbage soup?! Instead of using bread to hold your sandwich together-try lettuce! 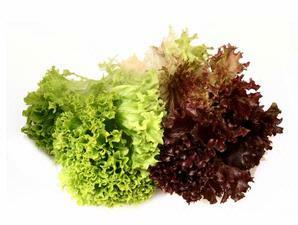 For best results, pick large, pliable lettuce leaves such as iceberg, spinach leaves, or red lettuce. Lettuce wraps are easy to create; Use just about anything you would to fill bread, tacos, pita bread, or burritos. (Chicken, turkey, veggies, beans, eggs, bacon, cheese, etc.) The key to a good wrap is a combination of a warm and flavorful filling — rolled into the cold and crispy leaf! 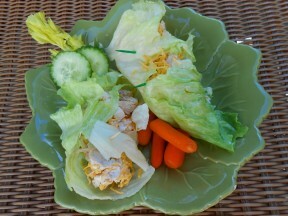 The sample wrap by KidActivities.net is sliced chicked mixed with a little mayo. It is sprinkled with finely shredded cheese. Can you purchase a leaf shaped cookie cutter? Make jell-o jigglers from yellow, red and orange jello! This would be cute if children make leaves before singing this song. As they sing the ‘individual’ color of leaf, they throw them up in the air. (Of course, when complete-leaves are then picked up!) If the weather is nice, collect leaves and sing/play outdoors! This is the way we rake the leaves in the middle of Autumn. This is the way we jump on the leaves in the middle of Autumn. This is the way we throw the leaves in the middle of Autumn. I love fall! Fall is exciting. It’s burrs on dog’s chins. It’s nuts on the ground. It’s a crisp dry sound. And the smell of them burning. It’s clouds in the sky. In a stiff fall breeze. Illustrated with full-color photographs, this book introduces young children to autumn leaves from thirteen different types of deciduous trees. Beginning readers will find the vocabulary very challenging, but even young children will enjoy listening and following the pictures as an adult reads it to them. In this classroom favorite, Ehlert relates the life cycle of a sugar maple from a child’s perspective. The unique illustrations will grab the attention of the youngest listeners, while the captivating text will engage older readers. In the simplest of terms, this book explains why leaves change colors and fall from the trees. Also included is a list of activities children can do with leaves. There you have it, 49 leaf activities for kids. We hope you have enjoyed the various leaf themed art, crafts, activities, and games. These ideas are a great way to get kids engaged with the season. If you want more fall themed activities, check out our apple theme and our November activities list.